December 7, 2011. We have received some historical information about this boat, and hope to get more. Back in the mid 1990's it belonged to Rudy Hinshaw who kept her in Deltaville, Virginia. She did not have a name when he bought her, and he did not name her. When he got her she had the original gas inboard (probably the original Palmer 27) and he replaced it with a Yanmar diesel. The hull had been regelcoated white by a previous owner - prior to that it was a turquoise blue. January 14, 2009. 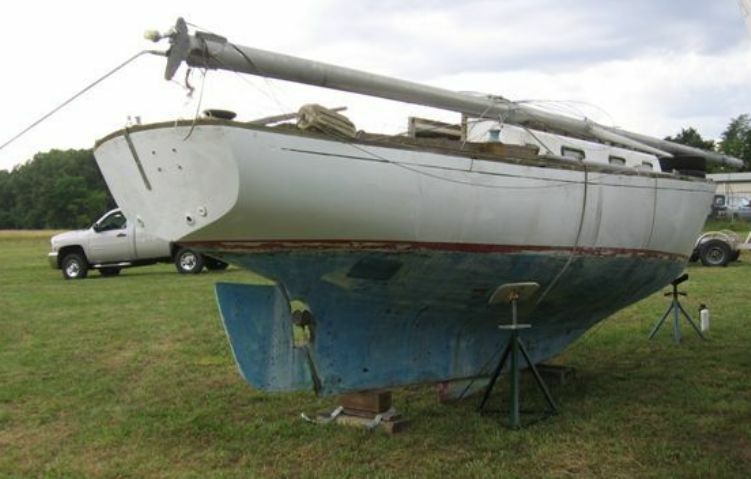 On Ebay min bid $625, no mast, boom, sails or trailer. No bids yet. 5 days left. December 26 , 2009 DFI David (last name unknown at this point) updated us regarding a new Ebay ad. The boat has so far avoided the ultimate end, and is still waiting for a rescue. On Ebay, ...Minimum bid now $900 without trailer. If anyone pursues this boat please try and find out the hull # from the nameplate, if one is still on the boat. "This boat will be cut up, no parts will be avail, remove or noted, no long avail. Stephen"